Click-&-Go™ Protein Reaction Buffer Kit provides researchers everything required to perform the click reaction on azide or alkyne tagged proteins with the corresponding click detection reagent for subsequent downstream analysis. Each kit includes sufficient material to perform 25 reactions for subsequent analysis by gel electrophoresis, western blot or mass spectrometry. 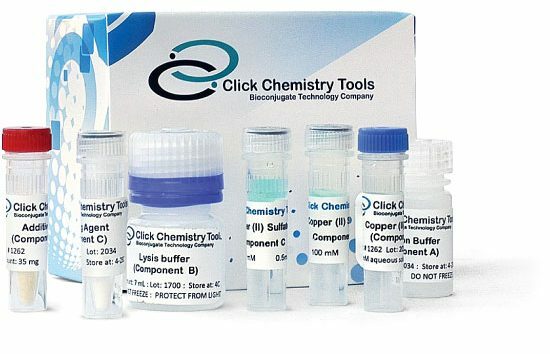 Click-&-Go Click Chemistry Reaction Buffer Kit provides researchers who have biomolecules labeled with an azide or alkyne and the corresponding click detection reagent with all the necessary reagents to perform an up to 25 copper-catalyzed click reactions for subsequent analysis by gel electrophoresis, western blot or mass spectrometry. The kit utilizes a copper chelating reagent to stabilize a catalytically active Cu(I) to accelerate the rate of CuAAC. The use of copper-chelating ligand also minimizes amount of free copper in solution, thus limiting the generation of reactive oxygen species (ROS) and protecting against undesired oxidative damage side reactions to proteins (e.g., GFP, RPE), nucleic acids (e.g., RNA, oligos), and other biomolecules. The performance and components of this kit are identical to Click-iT® Protein Reaction Buffer Kit from Thermo Fisher Scientific. Click-iT® is a registered trademarks of Thermo Fisher Scientific. Click Chemistry Tools is not affiliated with or endorsed by Thermo Fisher Scientific. Click-&-Go™ Protein Reaction Buffer Kit IS NOT manufactures, distributed, or affiliated in any way with Thermo Fisher Scientific.